Situated on a hill near Enniskerry in Co Wicklow, Powerscourt House has a fascinating history, as do the impressive gardens which surround it. Today it’s mostly the gardens that are of interest. While still an imposing presence, the house was almost completely destroyed by a catastrophic fire in 1974 and while a restoration in 1996 returned it to a usable condition, little of its original grandeur remains – most of the ground floor is now used as retail outlets, with just two rooms returned to the way they looked in the time of its pomp. The first house on this wonderful site was a large and impressive castle, built in the 13th century by the Norman La Poer (nowadays Power) family, at a location that was militarily strategic as it overlooked the valleys of three rivers, the Dargle, Glencree and Glencullen. In the 1730s the 1st Viscount Powerscourt, Richard Wingfield, a member of a family of increasing wealth and power who had owned the estate, which comprised over 50,000 acres of land, for over 100 years, commissioned an extension and remodeling of the castle to create a modern country mansion that reflected his status. The resulting house, designed by Richard Cassels in the Palladian style was completed in 1741 and, from the outside at least, was very much as the it appears today. Although there is no visible sign of the original castle, it’s there and detectable in areas of the house where the walls are up to 8ft thick. by King James I. In 1618 Richard Wingfield was appointed Chief Governor of Ireland by the Queen and given the title Viscount Powerscourt. Over the generations members of the family served in various positions for the English Royal family. including in later years in both the House of Lords and the House of Commons, sometimes representing Wicklow but more often constituencies in England. The National Library has an extensive archive of documents relating to Powerscourt, among them a fascinating series of ledgers, giving detailed accounts of the workers on the estate, the work they carried out and what they were paid. There are ledgers for various years from 1751 right up to 1919 which give a wonderful insight into both the running of the estate in those times and the daily lives of those who staffed them. The total spent on outdoor casual labour that week – for gardening, farm & forestry work and gamekeeping – was £27 15s 7d – in today’s money that’s roughly somewhere between €2300 and €3800 ($2500 and $4000). A notable member of the family was Theodosia Howard, who became Lady Powerscourt when she married the fifth Viscount in 1809. 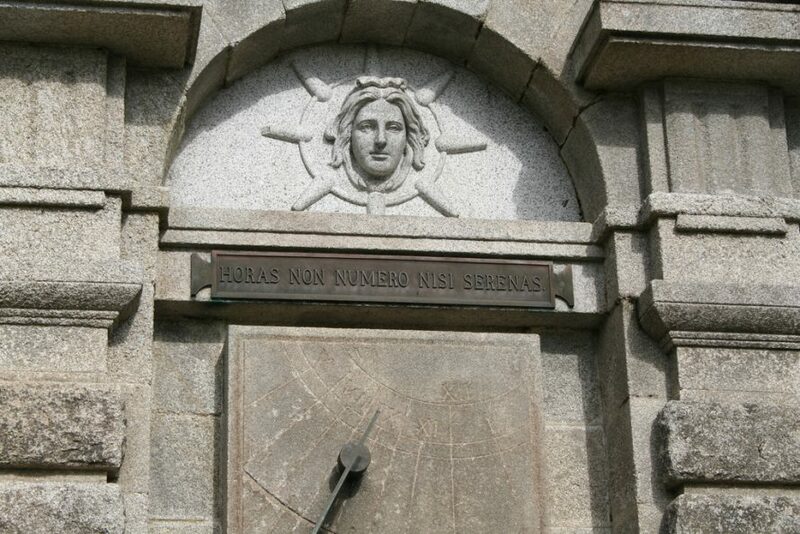 Throughout her life she was a keen student of the Bible, and hosted a series of influential conferences at Powerscourt between 1830 to 1833 on the subject of Biblical prophecies, then a quite novel area of interest. She is still considered a hero and a pioneer by those who are interested in such prophecies today. The last Wingfield to live at the estate was Mervyn Patrick Wingfield, the 9th Viscount, who served in the 2nd world war and was held prisoner by the Germans. He never fully recovered from his ordeal and by the early sixties was in a precarious financial situation which left him with little choice but to sell Powerscourt. The estate was purchased in 1961 by Ralph Slazenger, a member of the Slazenger Family of sporting equipment fame, whose descendants still own it today. In an interesting twist his daughter Wendy married Mervyn Wingfield, the 10th Viscount, the following year and thus the Wingfield family retain their relationship to Powerscourt still. The years since have seen the Slazengers overcome many setbacks. In November 1974 all but the east wing was destroyed by fire, with paintings, furniture and ornaments collected over many generations also lost. In 1982 in a terrifying raid on the house Ralph Slazenger and his wife were held at gunpoint, after which they moved to the Isle of Man and never again lived at Powerscourt. In 2011 tragedy struck when a small plane piloted by Michael Slazenger, Ralph’s son, crashed while landing at an airstrip on the estate, killing both him and his passenger. In spite of all this the family are still involved in the day to day running of the house and gardens, and have improved and updated facilities in recent years making this, deservedly, one of the most visited tourist attractions in Ireland. 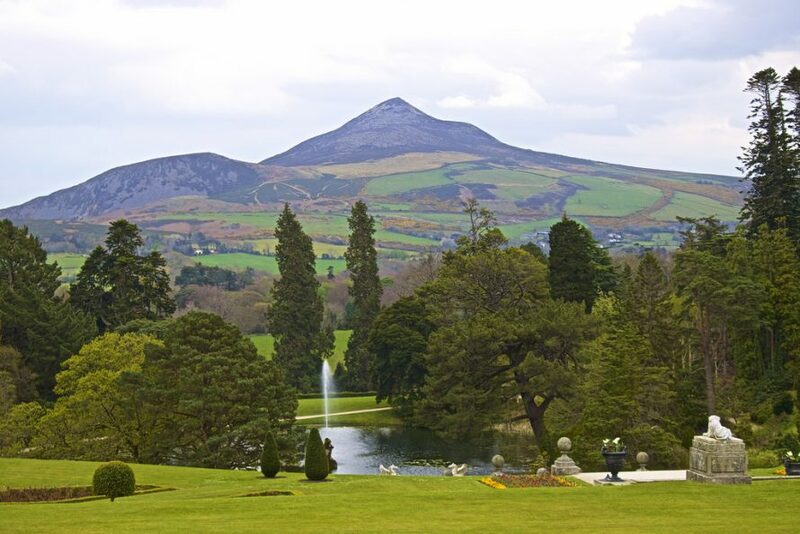 The real glory of Powerscourt is its varied gardens and their remarkable location surrounded by wild Wicklow countryside. There is a lot to see – you’ll easily spend a half day in the gardens and could happily stay longer. The Italian Garden is laid out on a series of steep terraces running from the house down to a lake It is designed in a formal symmetrical style fashionable when it was created in the mid 1800s, which contrasts wonderfully with the mountains that overlook it all. 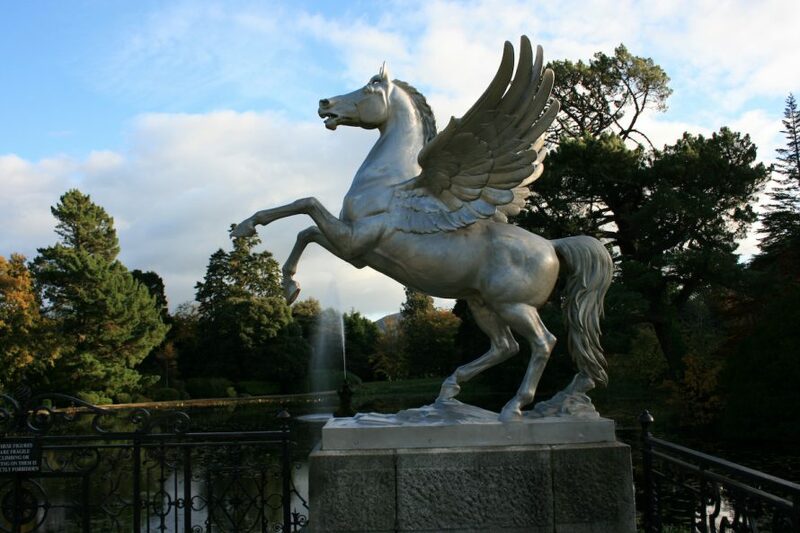 Wide lawns and brightly planted flowerbeds surround a central fountain and there are some great statues, most notably the huge pair of winged horses by the lakeside – though I am particularly fond of the group of children and the cupids. This is a later addition, from the early years of the 20th century, and in total contrast is densely planted, with narrow winding paths lit by stone lanterns leading to the centre. 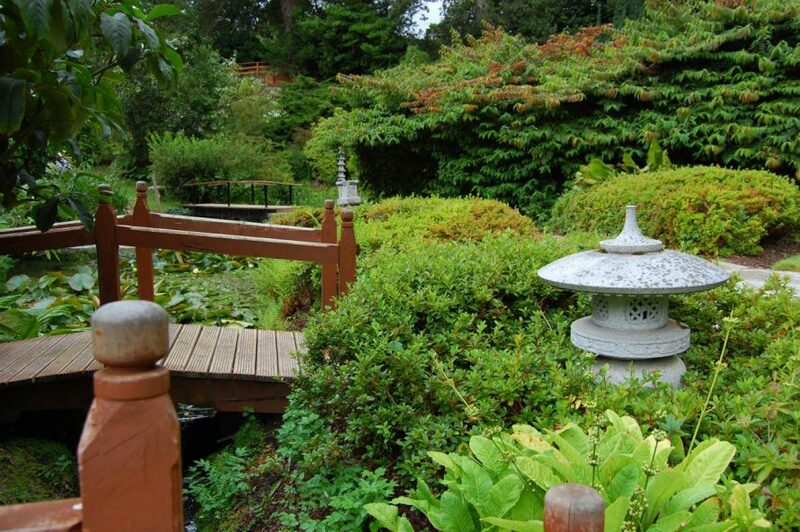 There by a stream crossed by Japanese style bridges you can rest in a pagoda and enjoy the peaceful surroundings. The best time to visit is probably in Spring when the Azeleas are in flower, but the luxuriant and careful planting means it’s glorious at any time. 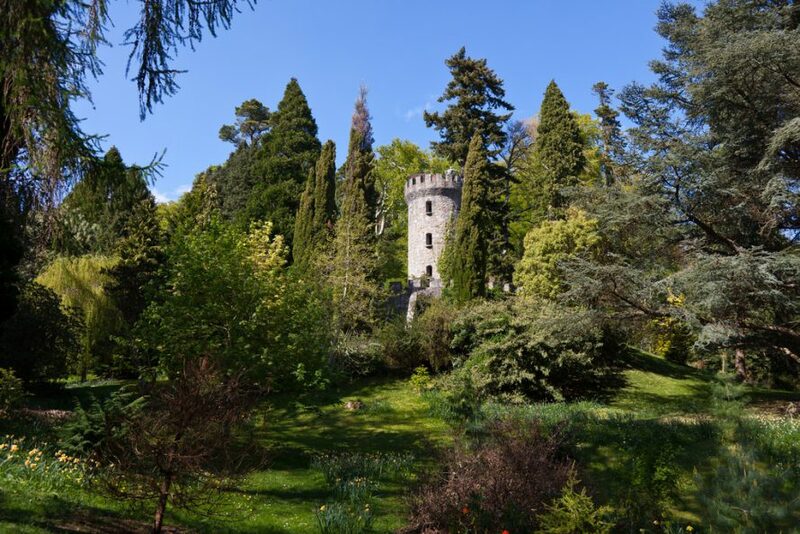 The walk to the tower brings you along a shady path through a wooded area with more than 250 varieties of tree, planted over the last two centuries. The tower always make me think of Rapunzel – you can easily imagine her calling out from a top window – and you can climb to the top for great views over the gardens and the valley. These are just some of the gardens, I haven’t even mentioned the Walled Garden or the Pet’s Cemetary where beloved dogs, ponies and even a cow belonging to the Wingfield and Slazenger family are buried, or the wonderful walks or the beautiful gates you encounter as you explore. You get the idea – a lot to see! While on land which no longer forms part of the estate, the waterfall is worth a visit. You’ll need to drive – it’s about 6km or 4 miles away from the house. 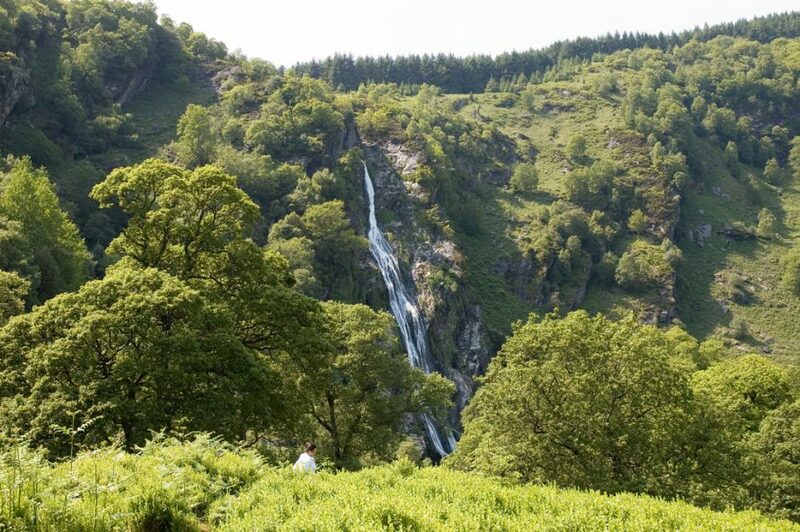 It is Ireland’s highest waterfall, 121 metres (398 ft) high, and rushes down a green hillside in dramatic fashion. The planned woodland around the waterfall is a lovely place to walk or, if the weather allows, to have a picnic. 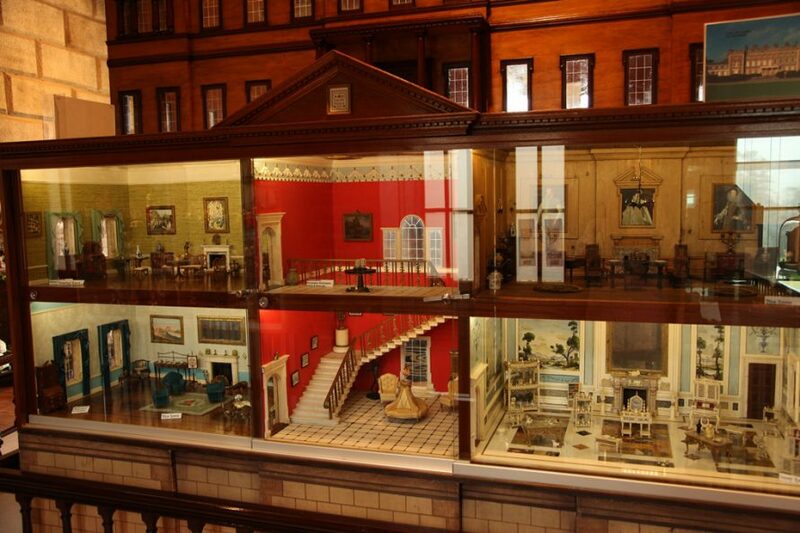 If you are visiting with children, they will certainly want to see Tara’s Palace, a remarkable and enormous doll’s house, which is the centrepiece of the Museum of Childhood. Its 22 lavishly decorated rooms are in the style of a grand 18th century Irish mansion and many of the paintings, furnishings and fittings were specially designed and created by top artists and craftspeople of the day. There are other houses too, maybe less extravagant but no less interesting and beautiful, as well as a number of other historic toys. While the house has been to some extent restored, or rebuilt, it was so badly damaged by the fire that almost nothing remains of the original interior. There is however an excellent restaurant and some good shopping inside which make it worth visiting after touring the gardens. Powerscourt is open year round but being a garden, the best time to visit is obviously not Winter. All other seasons have their own interest and charm – from Spring when the Azeleas and woodland flowers are in bloom, through Summer when the gardens are at their colourful best to Autumn with its multicoloured trees and low sun creating great opportunities for photographers. Allow ample time – you will need at least 2-3 hours and preferably more. It’s worth looking at the satellite view on the map below to get an idea of the scale of the place. You can buy tickets online in advance – though it’s not really necessary. Note that the Waterfall needs separate tickets. 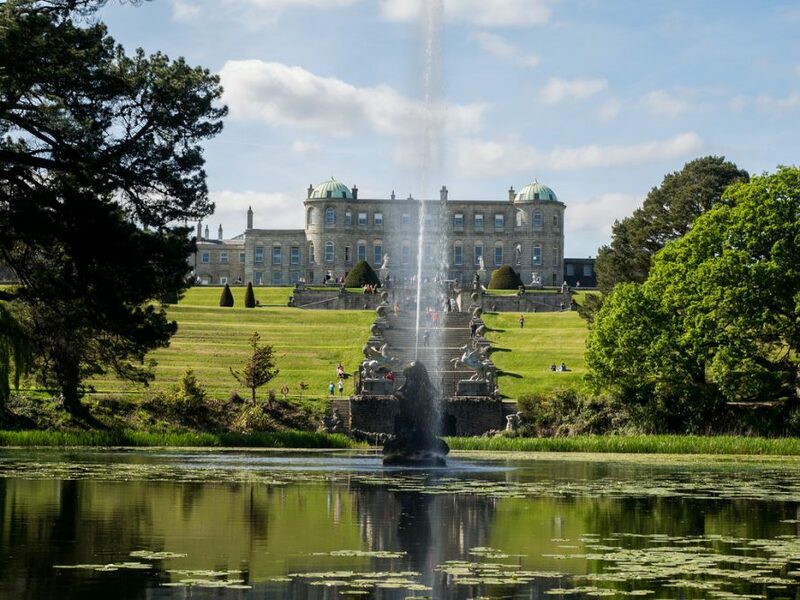 Have you something to add about "Powerscourt House & Gardens"?